Students at elementary campuses across the Harlingen Consolidated Independent School District will be greeted with transformed learning spaces as they enter their new classrooms for the 2016-2017 school year. In January, a committee comprised of teachers and administrators from all 17 elementary schools rated and ranked designs from different classroom furniture vendors. The focus was placed on selecting furniture and technology that would optimize the classroom environment by creating spaces for active learning and increased productivity. New desks with angular shapes will allow teachers to quickly and effortlessly assemble different group configurations into pods of various sizes, maximizing student engagement and participation. This type of collaboration is evident in collegiate and professional workspaces. Each third, fourth, and fifth-grade classroom is receiving 25 new chairs and desks in addition to a 52-inch monitor. Each grade level is also receiving a digital package including 12 iPads, a Mac computer, and an Apple TV. Larger campuses with more than four classrooms in a grade level will receive two digital packages. 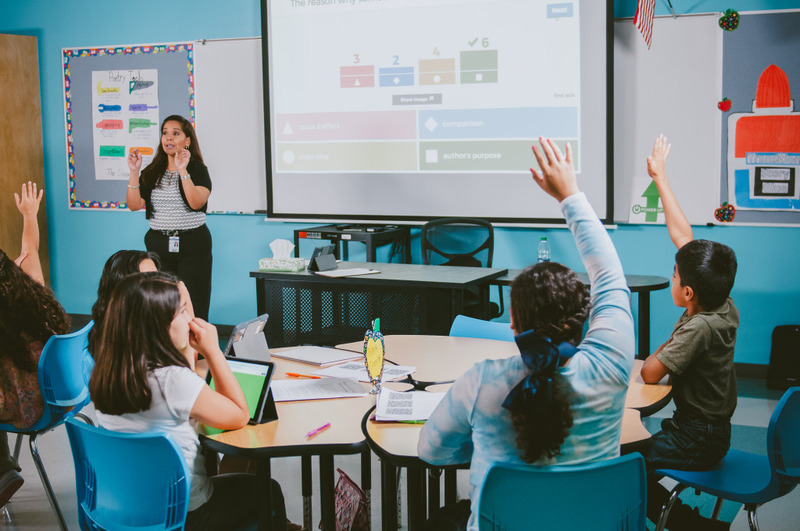 The modernization of classroom furniture directly aligns with the district’s strategic plan, “Transforming Learning for Global Achievement,” by creating flexible learning spaces. The goal is to expand technology rich environments that empower students to maximize their learning experiences. The contagious excitement will undoubtedly be transferred to the thousands of hopeful students walking into transformed learning spaces on August 23. The district has allotted $480,000 per year from the approved tax ratification, and the plan has been accelerated to furnish three grade levels this upcoming school year. The remaining elementary grade levels will be furnished and infused with technology within the next three years.